Did you just think it was The Kremlin and Chinese airports that had UFO problems? No sir! In fact, we’ve got a nasty alien problem in the skies over The Big Apple. 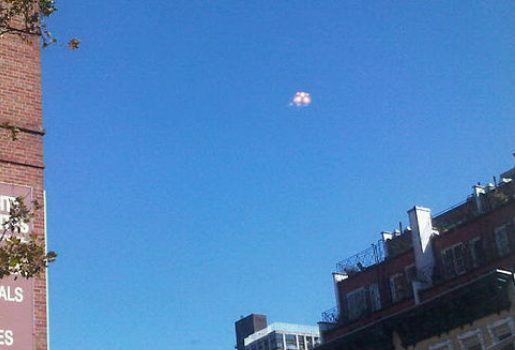 Right here in America, people in New York City’s Manhattan borough are in a frenzy after mysterious flying metallic orbs were spotted in the skies over Chelsea. “It’s been hovering there for a while. I’m just kind of baffled,” said Brooklynite Joseph Torres. “How can it be ordinary? There is something going on.” It looks like balloons to me, but then again, it’s more fun to think that it’s some kind of sinister flying saucer-style presence.